SILICON SLOPES, Utah – March 23, 2016 – Yesterday at Domopalooza, Domo announced an initiative to advance best practices and establish standards for APIs to improve how data is leveraged for business gain. Domo announced the Standards for APIs Tour this Spring to bring together key stakeholders across the country to address critical issues around improving API accessibility, reliability and value. 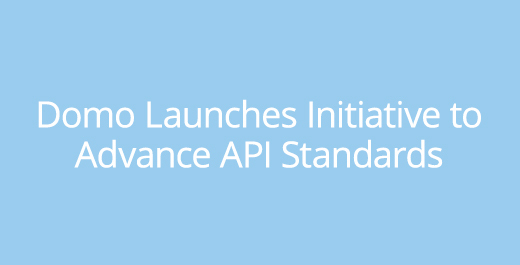 The goal of the initiative is to build on API best practices and lay the groundwork to advance the speed at which API standards become a reality. The first of these meetings will be held in Salt Lake City on May 3, followed by New York City on May 26, and San Francisco on June 9. With the growth of SaaS, mobile and Internet of Things, the volume and velocity of data continues to accelerate – creating an urgency around the need for API quality to be addressed. Guidelines for data connections, security, refreshing, performance and commercial terms are some of the critical areas that need to be addressed in order for the data economy to flourish. Interested parties can learn more and get involved via StandardsforAPIs.org.